of all the things i make us for dinner, this sandwich is the most popular with john. me: john, what do you want for dinner? john: ummm, i don’t care. BALTS= bacon, avocado, lettuce and tomato. our bacon is a bit different, but still delicious! i simply use this recipe from vegan mom, and we have dinner ready in less than 10 minutes! the reason this recipe is so yummy, has to be the addition of liquid smoke. it takes it to another level, and boy is it a good one! i always double the recipe, using a whole package of tempeh rather than a half. leftovers are definitely my friend! i usually only use half the amount of canola oil as well, if any at all. i don’t find it adds much to the recipe, plus i spray my pan with some canola oil before i start grilling it up. find bacon recipe **here**, on vegan mom’s blog. 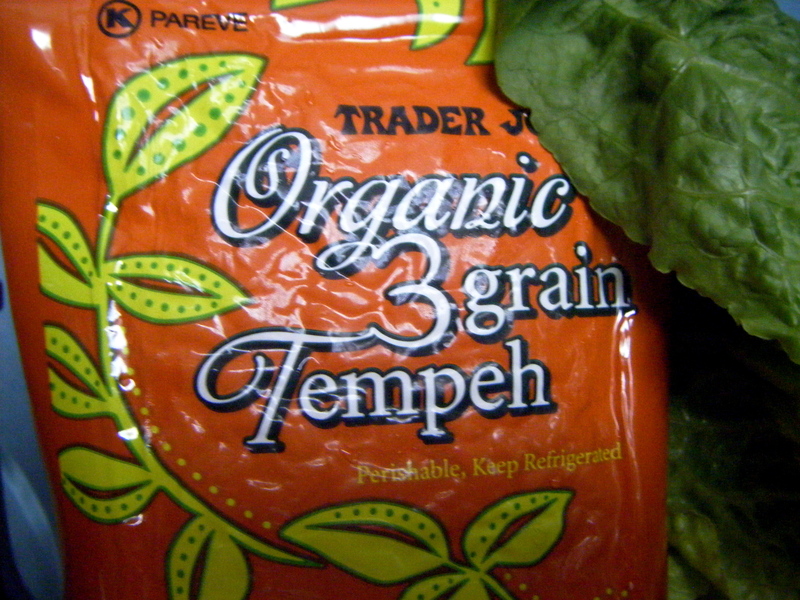 1. start by opening your tempeh package and cutting your block in half, width wise. you should have two pieces here. 2. next, slice each half into 2 pieces, length wise. the entire block is now cut into quarters. 3. finally, slice what is now each quarter of the block into thin strips, length wise. i always end up with eight pieces altogether, you may be able to slice your strips thinner, or maybe like them thicker. no biggie. i should have taken photos of this process! 4. warm up a grill pan (what i use), skillet, or cast iron pan to medium. 5. while your pan heats up, mix up the liquid ingredients from the recipe above. 6. spray your pan of choice with a bit of non stick spray, then lay your tempeh strips in the pan and pour about 3/4 of liquid on top. 7. allow the tempeh to absorb the liquid, flipping occasionally. as the liquid is absorbed, add the remaining liquid and continue to cook. 8. when the bacon is almost ready, toast your bread. 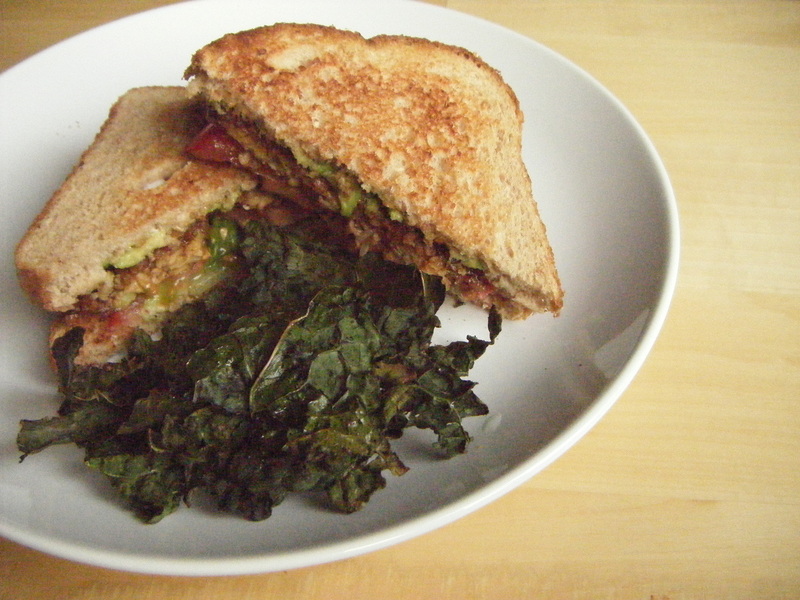 we like to spread both some veganise and some mashed avoacado on our sandwiches. 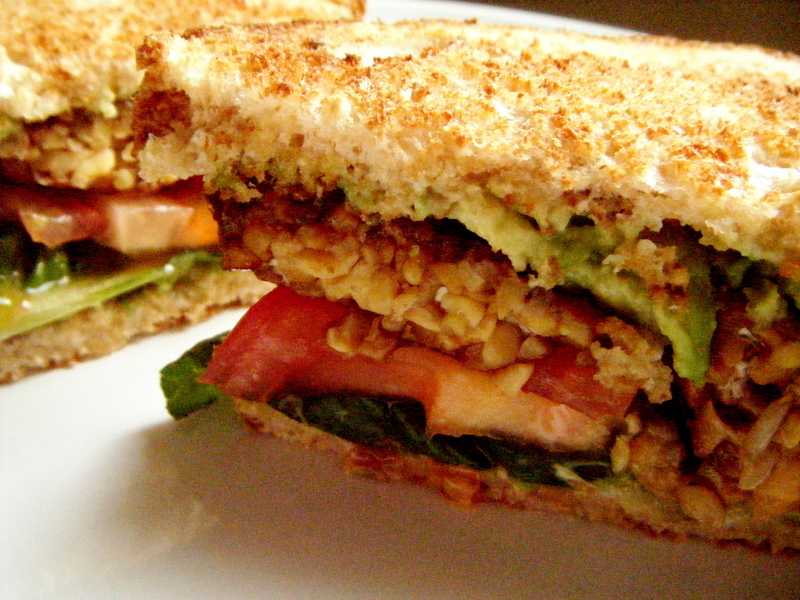 layer on lettuce and tomato and finally throw on your cooked tempeh. we ate ours last night with some less than stellar kale chips. i left them in the oven only a minute too long and they were a tad burnt. still nutritious though! what is your go-to recipe?! The first post: Introduction and a Memorial Day dinner! i have been toying with the idea of starting a blog for quite awhile now, and today is the day! the title of my blog reflects my love of cooking for my fiance, john. we have been engaged almost 2 years, and together almost 6! first up, a vegan potato salad! 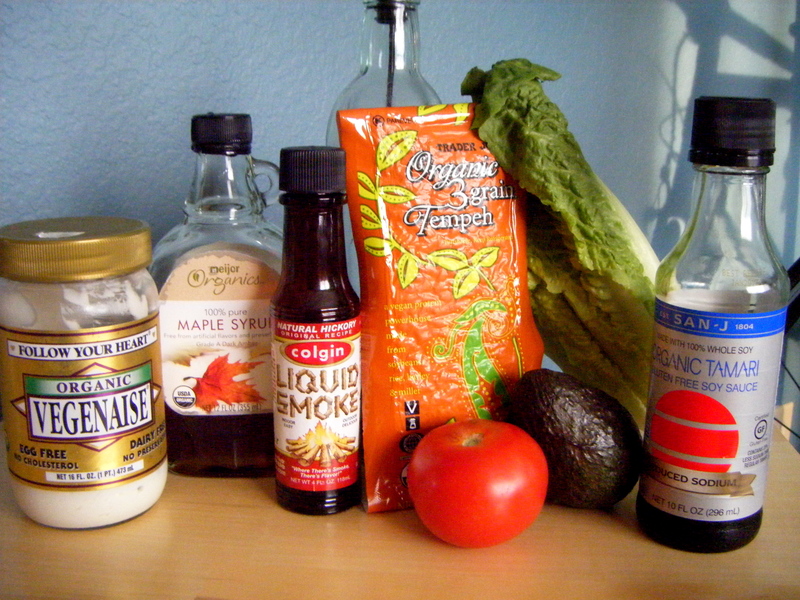 i used this recipe, replacing mayo with vegenaise, and adding scallions. 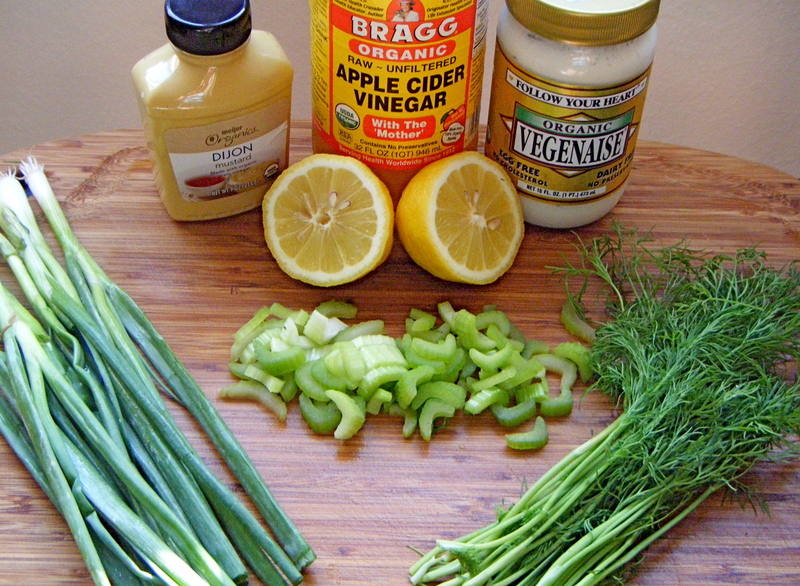 scallions, celery, fresh fill, apple cider vinegar, dijon, vegenaise and lemon juce! i had a serious craving for barbeque this afternoon, so instead of making veggie burgers as planned i whipped up this bbq tempeh and served it in a gluten free wrap for me and on top of some toasted bread for john. 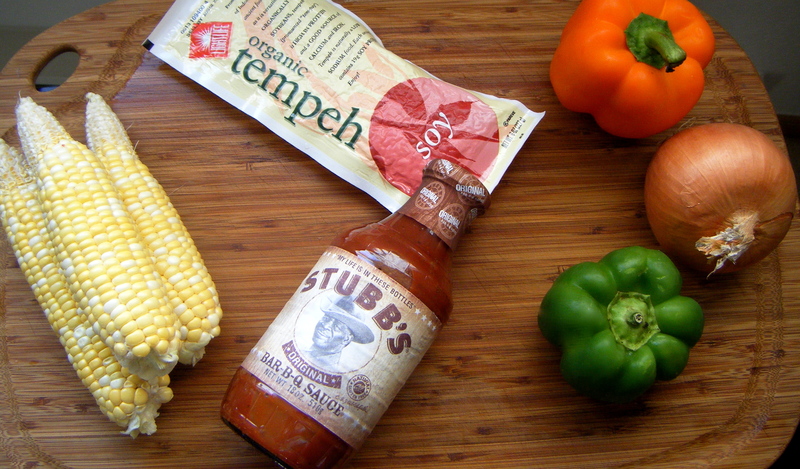 bbq tempeh ingredients. the corn was steamed and served on the side with some earth balance, mmm! i also made us some sangria to sip, it was delish! just a lil something fun for the holiday. john had to work today, but i had the day off! gotta get to sleep, tomorrow it’s back to work!